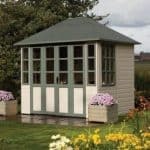 Now here’s a summerhouse to be proud of! 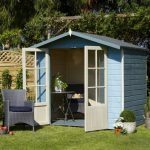 The Blenheim wooden summerhouse has stunning bi-fold doors which open fully so you can still enjoy the outdoors but remain inside! It’s also perfect for warmer evenings when you want to relax but admire the garden too. 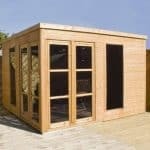 It is constructed out of long lasting and hard wearing wood and the glass panels of the doors allow plenty of light and air inside. 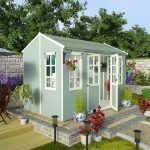 With a smart roof and plenty of interior space it’s the perfect garden feature and will last for years. 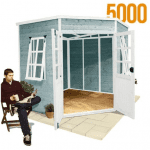 This building is home delivered and assembled for your convenience. 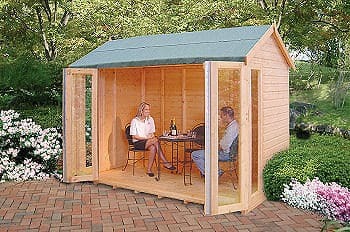 My husband and I just bought this outdoor summerhouse. It was small, but cozy. We could feel the breeze come in through the big doors that stay open. I love how there is windows all around the summerhouse. I love the structure and set up of this. So durable and gorgeous. This was a terrific buy. 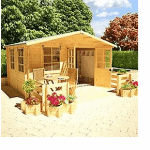 Our family members and friends give us compliments on this summerhouse. We are outside basically all summer in this. We watch the sunrise, and the sunset as well in here. The summer heat didn’t bother us because of the breeze that would pass through the doors. I am glad they put the doors like that because it was such an advantage. Can I ask do the side windows open? No I am pretty sure the side windows don’t open.